On CKUT 90.3FM. Nipivut means “our voice”, it is the first southern radio program broadcast by and for Inuit in Inuktitut. This bi-weekly Inuit cultural radio program gives Inuit of Montreal a voice in this city: providing essential news for Montrealmiut and showcasing Inuit culture and language to the greater Montreal community. 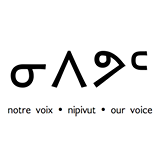 Nipivut provides programs in English and French when possible, and promotes the Inuktitut language in the city with Inuit music, Inuktitut lessons, and news and public discussions in Inuktitut. Nipivut seeks to connect Inuit living in Montreal with their families and friends in the north as well as the larger community of Montreal. •Jeannie Sappa talks about violence against women. •Joey talks to Tommy Kingwatsiak about soap stone carving. •Joey also speaks to Saimataa Manning about the services at the Ivirtivik Employment Centre. There are also songs from Charlie Adams, Agaaqtoq, The Trade-Offs, Northern Haze, and Sumé. • A bunch of music from The Jerry Cans, Elisapie, Etutu & Susan Peta and Riit. • The grand opening of Nunavik Sivunitsavut! Akenisie hosts, and there's a bunch of Inuktitut music on the show as well. Enjoy! • Music! The Jerry Cans played a concert at the Old Port. You'll hear a song called Niki Pawatin by Moe Clark featuring Nina Segalowitz as well. Here's Episode 50 of Nipivut! On the show we have Saladie Snowball talking about Pijunnaqunga, and Nina Segalowitz gives a performance at Tillutarniit. That, plus songs from Elisapie, Northern Haze, Susan Aglukark and more! • Annie goes to Taku, an Inuit art carving exhibit, and speaks to artists. • Joey and David went to Tillutarniit, the Inuit film festival that happened at Concordia last week. • Annie speaks to the Inuit Art Foundation about the Igloo Tag program. • Songs by Becky Han Music, Sumé, Silla + Rise! Here’s Episode 47 of Nipivut! On the show, Annie talks to Eva Deer, who helped organize the Aaqitauvik healing workshop that happened in Montreal earlier this month. Also, Angus Andersen is on the show talking about his Muskrat Falls Water Bottle Campaign. That, and songs from Twin Flames, The Jerry Cans, Larry T, The Trade Offs and more! Share, like and enjoy. Here's our Aboriginal Day Special! On the show you'll hear over 30 conversations Annie Pisuktie and Stephen Agluvak Puskas had with those who came out to Cabot Square for Aboriginal Day, June 21. Lots of Inuktitut and music — all by Kelly Fraser — on this episode. Akenisie Qumak hosts!